Force Motors is targeting a 20 % marketshare in the Indian off-roader space, which is said to be good for 12,000 yearly units. The Gurkha will be launched in India, in the next couple of months, and the off roader will be sold in three variants, with both BS3 and BS4 options. The Gurkha SUV will be aimed straight at the Mahindra Thar, the only other diesel off roader in India. The Maruti Gypsy has a niche following of its own, as the off roader is a petrol-only model. 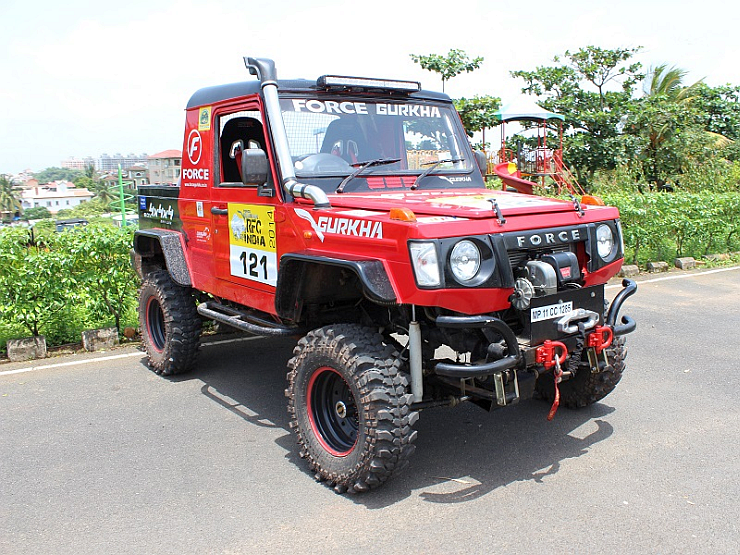 Coming back to the Gurkha, Force Motors has entered a number of heavily modified Gurkha off roaders for the Indian leg of the Rain Forest Challenge, that’s currently underway at Goa. These Gurkha’s feature heavily modified, Daimler derived OM611 turbo diesel engines that output over 200 Bhp. The RFC prepped Gurkha also features a new gearbox that can handle the additional power and torque. Armed with a custom lift kit, solid axles up front with leaf spring suspension, and a hydraulic steering borrowed from Force Motors’ Balwan tractor, the RFC prepped Gurkha is an altogether different breed of off roader, when compared with the series production version. The RFC prepped Gurkhas have been built to demonstrate the capability of the Gurkha platform, which traces its lineage to the Mercedes Benz Gelandewagen (G-Wagen). In production trim, the Gurkha, which will be available in soft top and hard top versions, in 6 seat and 5 seat configurations respectively. The off roader uses a 2.6 liter Daimler derived OM611 turbo diesel engine that outputs 80 Bhp of peak power and 230 Nm of peak torque. A mechanical 4X4 shifter and a five speed manual gearbox comes standard on the top-end hard top Gurkha, which also features mechanical differential locks on the front and rear axles. Interestingly, Force Motors will market the upgraded Gurkha 4X4 off roader through its personal vehicle and commercial vehicle dealerships across the country. Production of the off roader has already begun at Force Motors’ Pithampur factory, in Madhya Pradesh. Gurkha exports to African countries are already on and the off roader will soon be launched in the Indian market.